AstroCryptoTriviology: A Jones for MOL #7: Hatches? We Don’t Need No Stinking Hatches! A Jones for MOL #7: Hatches? We Don’t Need No Stinking Hatches! I addressed the topic of hatches in MOL back in #3 of this series. But there is more to be said on the topic. Plus, I just recently thought of the title for this blog post, which is much better than the title of #3, and could not resist using it. If I compile these individual posts into a longer article or a book chapter, I will use the title from this blog post. For a brief history of the entertaining catch phrase behind this title, see “Stinking Badges” at Wikipedia (ref. 1). In #6 I explained the evidence for my assertion that the Gemini-B capsule was to be sealed and depressurized for most of the 30-day manned MOL mission. The isolation of the capsule seems straight-forward. One obvious approach would be for the last pilot leaving the Gemini-B to close a hatch at the lab end of the transfer tunnel, permitting the subsequent depressurization of the transfer tunnel and the adjoining open capsule while maintaining the air pressure in the MOL. But as noted in #3, the evidence for a hatch at this location is ambiguous at best. I concluded that there was no independent pressure-seal capability for the transfer tunnel: the tunnel would have been open from the Gemini-B heat shield all the way to the interior of the MOL habitable volume. This is not unique in spaceflight: the Spacelab modules carried in the payload bay on many Space Shuttle flights were connected by a long transfer tunnel to the Shuttle’s crew compartment, and there was no hatch at the Spacelab module opening (ref. 2). But the crew module of the Shuttle was never intended to separate from the Spacelab while in-flight, while the Gemini-B was required to separate from the MOL for return to Earth. This will be the topic of a future blog post in this series. If the Gemini-B/MOL tunnel could not be closed off at the lab end, then maybe it would have been possible to seal off just the capsule by reversing the large pressure bulkhead (LPB) hatch, passing it through the hatch opening and then re-installing it from the tunnel side to seal the Gemini-B’s large pressure bulkhead (see Fig. 1). In this scenario, the separate heat shield (HS) hatch would have stayed stowed in its alcove in the wall of the transfer tunnel. Figure 1. 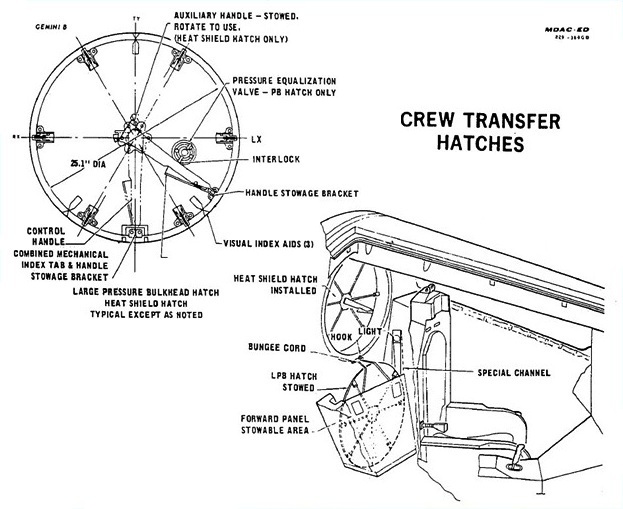 McDonnell Douglas illustration of the crew transfer hatches in the Gemini-B: the large pressure bulkhead (LPB) hatch and the heat shield (HS) hatch. Note the common features of both hatches, including the crank handle and the six dog arms. Note also the stowage location for the LPB hatch in the small alcove between the seats. The following analysis is based on my reading of the collected Gemini-B/MOL documentation, much of it provided by Dr. Dwayne Day from his visit to the U.S. Air Force archives at Maxwell AFB in Alabama in late 1999. The drawings from those archives are detailed and thorough, and bear corporate file numbers but not dates. However, a date may be inferred from the fact that the drawing numbers all contain the abbreviation “MDAC” clearly indicating the McDonnell Douglas Astronautics Corporation. McDonnell Douglas was formed from the April 28, 1967, merger of the McDonnell Aircraft Company, builders of the Mercury and Gemini spacecraft and prime contractor for the Gemini-B, and the Douglas Aircraft Company, prime contractor for the MOL itself (ref. 3). Thus, I have assumed that the drawings represent mature designs for their subject components, since MOL was heading into manufacture by 1967 and was cancelled just over two years later. There are some problems with the approach of reversing the LPB hatch. First, the hatch was too big to be passed through the hatch opening. The diameter of the hatch was 25.1 in. (63.8 cm.) (per Fig. 1), but the hatch opening diameter was only 24 in. (61.0 cm.) (per Fig. 2). This does not mean that such an approach is impossible under any circumstances: I have watched in amazed disbelief as a large airliner door is swung inward and then snugged up to the door frame from the inside to make an airtight seal, but that apparently requires some rotation of the rectangular doors to pass through the frame and then de-rotate to fit snuggly. No amount of angling or rotation would have allowed the circular hatch to pass through its circular opening that was over an inch smaller. Figure 2. McDonnell Douglas illustration of the edges and seals of the LPB and HS hatches. (In this illustration, the LPB hatch is labelled as the crew transfer hatch.) I have highlighted the LPB knife edge and the corresponding gasket, neither of which were labelled in the original illustration. I have also indicated the area of interest in the small diagram of the Gemini-B, to the left of the hatch detail. Second, the cross-section of the LPB hatch shows it to have had a type of “knife-edge” seal (ref. 4) which would work only if the hatch were oriented correctly (see Fig. 2). An extended ridge called the knife edge near the rim of the hatch would be compressed a recessed gasket in the rim of the hatch opening to make the seal airtight. 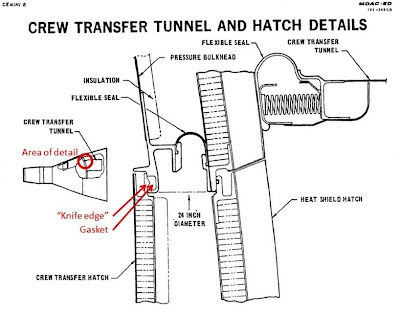 The gasket was only on the Gemini-B side of the opening, so if the hatch had been flipped around so that the crank handle was accessible from inside the transfer tunnel, then the knife-edge seal would have been facing away from the gasket. Third, the crank handle for securing the hatch was only on the Gemini-B side of the hatch (see Fig. 2). This handle was to be turned to drive six dog arms on the hatch into corresponding fittings on the hatch opening rim, mechanically wedging the knife edge of the hatch onto the gasket of the hatch opening, making the seal airtight. Conceivably the hatch could have been left in its usual place on the Gemini-B side of the opening, but the handle moved to the tunnel side, or a second handle could have been inserted on the tunnel side of the hatch. But the available diagrams give no evidence that a handle could be removed and reinserted on the MOL side. In addition, leaving the hatch on the Gemini-B side of the opening meant that it would have been on the vacuum side of the bulkhead when the capsule was depressurized for the 30-day duration of the mission. The hatch was clearly designed to be on the high-pressure side of the bulkhead, using the air pressure of the manned capsule to reinforce the seal against the gasket. Whether it could have provided an adequate seal for 30 days if the air pressure from the MOL was trying to push it into the depressurized Gemini-B capsule is unclear to me, but I suspect not. Fourth, I just realized that there would have been no need for the permanent structure between the seats to retain the LPB hatch (see Fig. 1), if the hatch were to have been used to seal the tunnel for up to 30 days. A temporary stowage location, perhaps just velcroed to a wall, would have sufficed. Thus, it appears that the LPB hatch could not have been reversed, installed and sealed from the tunnel side. The Gemini-B capsule was to be evacuated, sealed and decompressed for the duration of the MOL missions (discussed in #6 in this series). There was no hatch or other fixture to seal the transfer tunnel from the Gemini-B to the MOL at the lab end of the tunnel (discussed in #3 in this series). The LPB hatch of the Gemini-B capsule could not be made to seal nor could it be operated from the MOL side of the hatch (as discussed in this article). I can only reconcile any two of these three points. First, there would be no need for either a transfer tunnel hatch or a reversible LPB hatch if the Gemini-B were not to be depressurized. (This is the only case for which the title of this blog post is literally correct.) Second, there would be no need for a tunnel hatch if the LPB hatch were operable from the tunnel side of the capsule’s heat shield. Third, there would be no need for a reversible LPB hatch if there were an operable hatch at the MOL end of the tunnel. But at this juncture, I cannot say how all three of those conditions were to be fulfilled simultaneously on manned MOL missions. It is a mystery, and I hope that someone reading this blog post knows the answer and will share it with me. If that happens, I will pass it on. Why this was important to the end of the crew-occupied phase of each MOL mission, when the Gemini-B was to separate from the MOL and begin its return to Earth, will be the topic of a future blog post, but first I want to address other biomedical and human factors aspects of the MOL missions. “Stinking Badges,” http://en.wikipedia.org/wiki/Stinking_badges (accessed 17 Dec. 2012). Spacelab News Reference, NASA Marshall Space Flight Center, document number 14M983 (undated, ca. 1980), Sec. 3.2.2. Tunnel Systems, p. 3-19, http://www.scribd.com/doc/44577396/Spacelab-News-Reference (accessed 29 Aug. 2012). “McDonnell Douglas,” http://en.wikipedia.org/wiki/McDonnell_Douglas (accessed 27 Dec. 2012). There is surprising ambiguity on the Internet whether the “A” in MDAC” stands for astronautics, aerospace or aircraft. I have opted for astronautics. For a discussion of seal types in nautical hatches, see Freeman Marine Equipment, http://www.freemanmarine.com/Hatches2400Summary.htm (accessed 6 Aug. 2012), and Standard Equipment Co., http://www.standardequipmentclosures.com/marine-closures/boat-hatches/ (accessed 27 Dec. 2012). What was the depressurization/repressurization mechanism? I'm surmising valves in the Gemini which would be actuated by command from within the MOL, one set to open the capsule to space, another to admit atmosphere from reservoirs. Now, looking at the diagramme, it appears that the heat-shield hatch itself would make a halfway decent airseal. It's facing the right way for pressure inside the MOL to hold it in place, & it could be manipulated using a suction-cup gadget as customarily used for plate glass. This would result in a small but continous seepage into the Gemini, but this could be viewed as an advantage : even if the valves to admit atmosphere back into the capsule failed, as long as those holding it open to space could be reclosed, the pressure inside the capsule would gradually rise to the point that the hatch could be moved. Conversely, if the vent valve closure mechanism were to fail, but those valves were made sufficiently small compared to the admission valves, the Gemini could be repressurized to the point that one of the crew could enter & close them manually. Publius, thanks for the ideas. I had not considered that the heat shield hatch might suffice as a pressure hatch, because the Gemini-B design included a separate pressure bulkhead hatch. But maybe so. Personally, I have come to the conclusion that there really was a hatch at the MOL end of the transfer tunnel, possibly removable (like the Apollo command module docking tunnel hatch). With it sealed, and with the Gemini-B open to the tunnel, it could have been possible to decompress the Gemini-B plus the tunnel using valves in the tunnel structure, controlled from inside the pressurized module. I hope an upcoming declassification event will answer this question definitively. Or maybe one of my FOIAs will be answered..